Reciting our Pledge before each meeting is an excellent reminder of the ideals that we as a Board need keep in mind as we conduct Chapter business. A “pledge” is a solemn promise or undertaking according to Webster’s Dictionary. And, solemnly pledging to defend our environment can often feel to me to be overwhelming. It seems a promise only a super hero could hope to fulfill. But, in a way, I think that every one of our members is a caped super hero, each making individual contributions to our Chapter and the League. Imagine 43,000 caped crusaders dressed in tight bright Lycra from 240 Chapters nationwide fighting for the future of our planet! The Ikes’ Pledge (Izaak Walton League members are known as “Ikes”) serves as a mission statement that is much broader than any other environmental organization in the U.S. Our Pledge is not limited to protecting a specific plant or animal species or habitat, but encompasses the earth’s triumvirate: water, air, and soil. It challenges us to consider and share the intangible benefits of nature such as beauty. And, it asks us to value both the intrinsic and economic values of wildlife, woodlands and open space. This almost overwhelmingly broad mission speaks in large part to how long the Izaak Walton League of America (IWLA) has been on the scene. The IWLA was established almost 100 years ago when idealism was high and people were boundlessly optimistic about what they might accomplish. I am not so sure that if the IWLA was being organized today, a non-profit board charged with writing our mission statement, would dare to reach so far and broad. That being said, the IWLA has stayed true to its mission and has been very successful on so many fronts. Over the years, the IWLA has been involved in almost every major national conservation program in the U.S. Ikes have effected change and influenced public policy in five major areas. Clean Water: IWLA has been in the forefront of almost every major clean water battle in the U.S.
Public Lands: IWLA led the charge to form our Federal Land & Water Conservation Fund which is used to acquire public land. In Minnesota, the League was very instrumental in creating the Upper Mississippi River National Wildlife & Fish Refuge, Superior National Forest, the Boundary Waters Canoe Area Wilderness, Isle Royale National Park and Voyagers National Park. Farm Policy: IWLA has supported many state and federal regulatory policy changes to reduce erosion and regulate the use of toxic agricultural chemicals. It paved the way to set aside marginal farmland into “conservation reserves” and influenced federal/state subsidy programs linked to conservation practices that protect our soil and water quality. Clean & Renewable Energy: IWLA promotes renewable energy resources, advocates for the decrease in greenhouse gas emissions, and has been a proponent of Federal regulations on coal-fire power plants to reduce emissions. Community Based Conservation: IWLA through its Chapters across the U.S. has been involved in innumerable conservation projects, fish and wildlife habitat restorations, trail building, fish breeding, tree planting and outdoor skill building and youth programs. When I reflect upon the IWLA Pledge and what it has accomplished since it was formed in 1921, I am inspired to continue the League’s legacy of environmental work and activism. Thinking back to when I was young, I loved the adventures of DC Comic’s Justice League superheroes: Superwoman, Superman, Batman and Wonder Woman. And so, refusing to be resigned into thinking that I cannot make a difference, I put on my imaginary caped crusader outfit and try to fight for the purity of water, the clarity of air, and the wise stewardship of the land and its resources. Together we can make a difference. Perhaps it is time for you too to find your super power and consider becoming more active in our Chapter’s good work. Capes and Lycra are of course optional! Think of the noise in your life. We are bombarded by man-made sounds that intrude upon our thoughts causing stress and fatigue. Have you ever considered what the long term effect of living in such a noisy world might be? The phrase “Study to be Quiet” was one of Izaak Walton’s favorite mottos. It embodied Walton’s philosophy and way of life. So important to him was the tranquility and solace that he found in angling that he chose to end his most famous book “Compleat Angler” with these final four words: “Study to be Quiet”. Walton died December 15, 1683 at the age of 90 and was buried in Winchester Cathedral, England. Winchester is about seventy miles south east of London. The Cathedral’s south transept contains a small simple chapel with a stained-glass window. Funded by English and American fishermen in 1914, it is a memorial to Izaak Walton. The window depicts Walton sitting quietly reading, his fishing rod beside him. 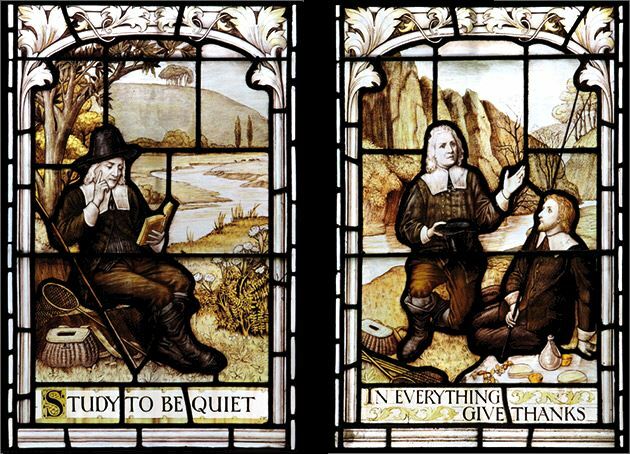 Below the image, written in stained glass: “Study to be Quiet”. Fisherman’s Chapel at Winchester Cathedral has become a place of pilgrimage for anglers from all over the world. The phrase “Study to be Quiet” is Biblical in origin (1 Thessalonians 4:11). While Biblical scholars attribute the verse to the virtue in being humble in spirit, word and action, Walton appropriated and expanded the phrase to extol the spiritual benefits gained by quiet contemplation immersed in nature angling in his beloved trout streams. Walton lived during turbulent times in England. A bloody civil war raged across England for almost ten years (1642-1651). Additionally, Walton suffered profound personal losses in the deaths of two wives and eight young children. Angling and writing offered Walton a place of respite for peace and emotional healing. He found the close friendships and insights into nature formed during angling to be far more compelling than the number of fish that he hooked. I find that the phrase “Study to be Quiet” is as relevant today as when Izaak Walton lived. During these trying times of political turmoil, heightened reliance on technology, and increased detachment from our natural world, all of us would do well to heed Izaak Walton’s favorite motto. History Highlight- Who Was Izaak Walton? Watch our Newsletter for an upcoming Chapter event to discuss this influential book sometime in the Fall of 2017! In the final decades of the twentieth century, remarkable progress was realized in the reduction of lead in our environment. Prior to the 1970s, lead was ubiquitous; it was in our house paint, gasoline, pottery, and plumbing. We were not only poisoning our environment, but also ourselves--and we knew it. So we rolled up our sleeves, found non-toxic alternatives, and regulated lead. Because of these efforts, very little lead is being released into our environment through these routes any more. Lead pipes, for example, have been replaced by copper and plastic, and solder is lead-free. Instead of lead, zinc and titanium are used to produce pigments in today’s house paint and ethanol serves in place of tetraethyl lead to boost octane levels in our gasoline. In each case, viable alternative materials and techniques were developed in conjunction with lead regulations so that the environment was protected and livelihoods and economies were not up-ended in the process--a win-win. So, what next? Where is progress feasible? Where are there both a lead contamination problems and viable alternatives? Fishing and hunting. Nearly all fishing sinkers and the large majority firearms projectiles are still lead. This would not be a problem except for the fact that almost every time an angler loses his or her rig and darn near each time a hunter shoots, lead ends up strewn on the bottom of a waterway, littering the forest, or lodged in the flesh of wounded game. This “lost lead” is an inevitable part of fishing and hunting. This is a lot of lead. And it does not break down. It persists, accumulating in our environment year after year. Furthermore, lead is highly toxic. One does not need to be a scientist to conclude that scattering it across our woods and waters is a bad idea. And, although the hazards posed by this “lost lead” to humans and to the environment are multiple, birds are the most vulnerable to its toxic effects. Lost lead has a nasty habit of showing up in birds’ digestive systems. Birds eat it. Ducks and other birds mistake it for grit--thinking they are getting sand and pebbles for their gizzards. They are just birds, and cannot tell the difference between a pebble and a fishing sinker. Eagles and other scavengers ingest lead too, but for another reason; they inadvertently consume lead-contaminated carrion. How does this carrion become contaminated? It is the residue of animals which have either consumed lead themselves or have been “peppered” by a hunter’s lead projectile and the lead stayed in them. We know that lead from hunting and fishing is a problem and fortunately the solution is right before us. 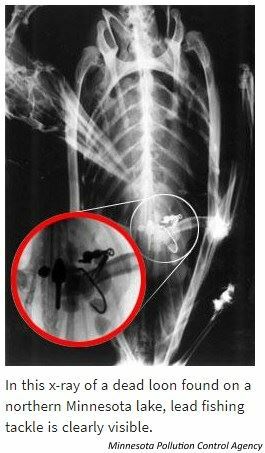 Lead has been outlawed for waterfowl hunting nationwide since 1991 and it is prohibited in California’s condor country. Lead fishing tackle is prohibited in many National Parks and in Maine--to protect loons. And it works out just fine because there is a multitude of viable, non-toxic alternatives. Tin, steel, and tungsten fishing sinkers are offered at most tackle shops. Non-toxic pellets (of steel, tungsten, bismuth) for shotguns have been around since the 1970s and copper bullets are widely available for centerfire rifles. Even shotgun slugs are offered in copper and other non-lead options. These options are every bit as effective as lead (sometimes even more so) and they cost only a little bit more. Given these perfectly viable, affordable, effective and available non-toxic alternatives, we seem to have an easy fix. Right? Wrong! Since lead was prohibited for waterfowl in 1991, no significant wide-reaching progress has been realized in the U.S. So, what is the hold-up? 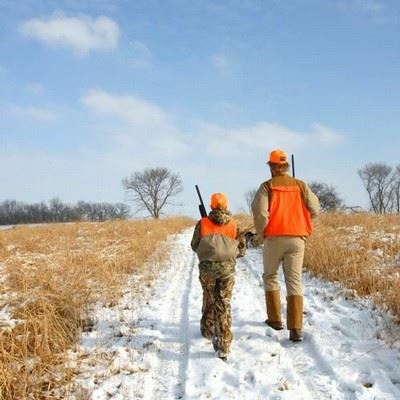 Part of the problem is that hunters and anglers, by and large, resist lead regulations. Why is this? Surely hunters and anglers know that good hunting and fishing are found in healthy, uncontaminated woods and waters. And surely they know lead is poisonous. So why would hunters and anglers want to contaminate the very environment upon which their pursuits depend? Why would hunters eschew lead paint in their homes yet willingly season their own family’s table fare with it, especially when non-toxic options are right there on the store shelf? Hunters and anglers are not the problem. They are victims like the rest of us, of a system where public opinion is swayed by moneyed interest groups and their slick use of media to distort facts, to produce wedge issues which encourage tribalism, and then to exploit the very cleavages they create for their own benefit. In the case of lead, three factors have conspired to make the problem seem intractable. First, the NRA has successfully misled hunters by conflating lead regulations with gun-rights. Second, the biggest economic beneficiaries of fishing and hunting, manufacturers and retailers represented by the National Shooting Sports Foundation (NSSF) and American Sportfishing Association, have exaggerated the cost of non-toxic alternatives--saying lead regulations would make fishing and hunting too expensive, pricing common people out. And third is the fact that most hunters and anglers already live in rural, government-regulation-averse, America. In the waning days of the Obama administration, Interior Secretary Dan Ashe idealistically (but naively) issued Order 219, phasing out lead projectiles for hunting on National Wildlife Refuge lands. Although scientists and environmentalists knew it was a common-sense step in the right direction, it never stood a chance. The current Interior Secretary revoked it immediately and was congratulated by the NRA for it and then heralded as a “true friend of the American Sportsman” by the NSSF. Lead is cheap and plentiful and the manufacturers of ammunition and fishing tackle hope to keep production rates growing and to protect their profit margins by continuing to use it. By aligning with the NRA and the various trade groups who oppose lead regulations, hunters and anglers are hurting the environment and undermining the long-term viability of the very same woods and waters upon which their pursuits rely. And they are possibly sickening themselves by eating their lead-laced game to boot. But here is the worst part: the NRA and the industry trade groups are duping hunters and anglers into advocating against regulations which would be in their own best interest--playing them for chumps. Although sweeping regulation like the 1991 waterfowl lead ban are not in the offing at the moment, a number of states are taking small steps. For example, in the Minnesota Valley National Wildlife Refuge, the lead shot is extended beyond waterfowl to also include turkeys and small game. And it has worked. Hunters still bag game and lead contamination is held in check. Currently, there is another small, but positive, proposal. The Minnesota DNR has convened a Nontoxic Shot Advisory Committee and is considering requiring hunters to use non-toxic shot for small game hunting in all Wildlife Management Area except those in the northeastern “forest zone.” This would not apply to private land but at least it is something. For now, in this current political circumstance, we are fortunate to be discussing it at all. Hunters and anglers are uniquely positioned at the moment to be the agents of progress on lead in the environment. They could be the force that re-establishes the lead-reduction momentum of the 1970s and 80s and they would also reap the benefits--better fishing and hunting and healthier fare for their families’ supper tables. If you have never gone fishing, living in Minnesota, you owe it to yourself to give it a try. The easiest way to get started is to pursue Minnesota’s most frequently caught fish--the “sunny.” The term “sunny” is used to refer to several similar species including the pumpkinseed, bluegill, and sunfish. Although sometimes a bit on the small side, sunnies are plentiful in nearly every waterway in Minnesota (including Bush Lake), are almost always eager to bite and are really great to eat. To fish in Minnesota, a license is necessary--with a few exceptions I describe here. First off, children (15 and under) who reside in-state do not need a license. Also, in most Minnesota State Parks, fishing privileges are included in the admission fee--without a license. And then there is “take a kid fishing weekend” (June 9-11, 2017) during which an adult may fish without a license if accompanying a child who is also fishing. Everybody else needs a license. Now for the hardest part of any fishing trip: catching fish. First of all, no angler is ever assured a fish. For those who want certainty, there is a seafood section at the CUB foods. Nonetheless, it does not take an expert to land a dozen or so sunnies from shore. The most rudimentary “kiddie” rod, a few worms from the garden, a hook, and maybe a small bobber is all you’ll need. Experiment a little bit, watch others who are catching them, and soon enough you’ll be catching them too. Did I tell you that sunnies make excellent table fare? Well, they do. Although even the smallest sunnies are delicious, most anglers consider 6 or 7 inches to be the minimum size “keeper” and anything over 8 inches is a “nice one.” The really good news: in most waters, an angler can keep up to 20 sunnies per day, year-round. Although some fishing purists practice strict “catch-and-release,” there is no reason to feel guilty for taking home a bucketful of sunnies for the fry pan. The limit on sunnies is set by the DNR at 20 because they reproduce prolifically. In fact, because many lakes in Minnesota are over-populated with sunnies resulting in stunted (abnormally small) fish, taking them home to eat can sometimes actually help the fishery! Cleaning and cooking sunnies is a snap. All you need to do is scrape the scales away, cut off the head (optional), slice open the belly and pull the guts out. That’s it. Then rinse it and it’s ready for the kitchen. Sure, you can try all sorts of fancy recipes, but with a fish as tasty as a sunny, less is more. I like to sprinkle them with a little salt and pepper, coat them with flour, and fry them for just a few minutes in butter--until they’re brown. Easy, tasty, and nutritious! Be warned, eating sunnies the way I suggest requires a bit of patience and practice because the bones are left in. The best way to go at them is gently with a fork, lifting the meat off the bones, inspecting each morsel visually, then occasionally plucking a stray bone from your mouth. Although a bone is sometimes unpleasant, you cannot actually choke on a fish bone. They are too small. If you absolutely cannot bare the prospect of a fish bone in your mouth, then you probably should just practice catch-and-release. The other solution is to fillet them. Although filleting sunnies is technically possible, especially if the knife is in skilled hands, it is uncommon. This is because filleting works best on larger fish, not sunnies. So, if you are interested in giving it a try, find yourself with some spare time this summer, or you want to try something “outdoorsy” with a child, consider sunny-fishing. Be sure to consult the DNR website about specific regulations (don’t take my word for it), always be safe near water, and leave nothing behind but footprints. Road mortality is a serious threat to many different species of wildlife. As temperatures warm, turtles, frogs, snakes, and other amphibians and reptiles begin stirring, sunning themselves, and moving across roads. Turtles are especially vulnerable to injury or death by automobile. You can help turtles and other wildlife, but remember- SAFETY FIRST! How Can You Help Turtles? Never put yourself or others in danger! If you are driving, safely park and turn on hazard lights to alert others to slow down. Be aware of your surroundings and traffic. Allow turtles to cross on their own, unassisted, if there is no traffic. If you need to speed it up, grasp all turtles, EXCEPT snapping turtles, gently along the edge of the shell near the mid-point of the body. Turtles may be excited and use the bathroom, don't drop it! Snapping turtles should NEVER be picked up by the tail (it damages their spinal cord). Use a branch, broomstick, or snow shovel to prod it along from behind. If it bites the object, use it to drag the animal to the other side of the road. Maintain direction of travel. Move the turtle to low ground, in a direct line, in the same direction it was traveling. Do NOT remove it from its area of habitat. Protect turtle nests you find in your yard with a cage or plate. Protecting nests for a few weeks (until the scent of the nest subsides) from predators gives them a better chance at being successful. Moving turtle nests is rarely successful. Advocate for amphibians and reptiles! Support the MN DNR Nongame Wildlife Program and contribute with the Loon Checkoff on your taxes. Contact local and elected officials and let them know you care about protecting them. Want to Help Pollinators? Think Twice About Releasing Honeybees! Most of us know that pollinators need our help. Starting a honeybee hive is not the answer! Honeybees are not native to North America, they were introduced from Europe. They are now one of the most abundant and widespread insects on Earth. Honeybee populations have increased 45% worldwide over the last 50 years and there is no risk of this bee species going extinct. Honeybees are important pollinators of agricultural crops but do not belong in areas providing critical habitat for native bees and other pollinators. What’s wrong with honeybees in natural areas? Want to help bees? Plant native plants and create habitat! This will help our native bees and honeybees! Our native bees and other pollinators (butterflies, moths, flies, and other insects) are in severe decline. Habitat loss, overuse of pesticides, industrial agriculture, and the loss of flowering plants have all contributed to this loss. By introducing honeybees, we add another stressor to our native bees that can have negative consequences. Help get the word out about native bees and their critical interdependent relationship with the natural world. All bees need adequate habitat that includes flowering plants. Introducing more populations of non-native bees when food is already scarce is counterproductive and has little to do with native pollinator conservation. Please, for the bees- think twice about introducing honeybees! Spread the word! Check out this factsheet! Water is of major importance to all living things. Our bodies are composed of 65% water. We need clean water to drink, to water our crops for our food, for the animals that need it to survive, and for the ones that live in the water. I feel very fortunate that I was able to spend some time at both Sacred Stone and Oceti Sakowin camps in Cannon Ball, ND this fall. We donated a compressor, 4 garbage bags full of high quality winter gear, and boxes of food. Although we knew no one, we were welcomed with open arms. There was such a overwhelming sense of gratitude, peace, and mutual respect. The people at camp were such an amazing group of diverse people, yet, we were all there for one main reason: to advocate for clean water. My trip culminated with the Veteran's Day March. Native, non-native, active and retired military personnel followed by civilians marched in solidarity to the front lines for clean water. Hundreds of us stood in resistance to the building of the Dakota Access Pipeline which threatens to pollute the Missouri River and millions of people's water supply downstream. We all stood there in prayerful protest even though the DAPL workers surrounding us had bullet proof vests and helmets on and were carrying rifles and shot guns. It was a very surreal situation. During the ceremony, two bald eagles flew over us. Simplified, bald eagles are sacred to the Native Americans signifying courage, wisdom, strength, and they are the the messenger to the Creator. The eagles just reconfirmed to all of us that what we were doing, standing in unity for clean water, was meant to be and a worthy cause. There are many opportunities for people to fight for the right to have clean water, whether here or there. I do encourage people to go out to ND if able. If not, call your representatives, divest from the companies that support DAPL, and share on social media what is happening there. As I said at the beginning: Water is Life! Mni Waconi! HerpMapper, a new mapping application, helps to prove it. Roads have been an issue for turtles for as long as vehicles have been around. The density of roads and cars has increased to a point where this hazard is impacting the long-term survival of some Minnesota turtle populations. Fortunately, there are relatively simple road improvements and habitat modifications that can be made to reduce the number of turtles crossing roads. These range from dedicated wildlife underpasses, modified culverts, wildlife-friendly curbs, and fences to enhanced nesting habitat. These mitigation efforts, however, can be expensive and are not always embraced by highway departments. The most effective way to communicate to highway departments the need for protection is tangible evidence showing which road stretches have a significant number of turtle crossings. Because State and County biologists cannot collect enough information to identify all of the significant crossings, public volunteers play a critical role in providing that data. or other wildlife observed on a roadway. In Minnesota, where all turtles are mainly aquatic, overland journeys usually occur during the annual early summer (late-May and June) nesting migration of egg laden females, or when newly hatched youngsters seek out the backwaters and ponds that will serve as their permanent home. Migration, again, occurs in early autumn when they return to deeper waters for winter hibernation. Data collected will be used to generate maps of known turtle crossing areas that can be shared with and used by conservation agencies and highway departments to prioritize and develop safer crossing areas. In addition, data can be collected in areas after mitigation strategies are put into place to better determine their efficacy. In June 2014, the Washington County Parks Department and Public Works opened a new “turtle tunnel” to help migrating turtles safely cross the road. The special German-built, under-the-road tunnel on County Highway 4 near Big Marine Lake in May Township, funnels turtles to the two-foot wide turtle tunnel by fences on both sides of the highway. County officials chose the tunnel’s location based on Minnesota Herpetological Society’s documentation of a large number of turtle crossings dangerous to both turtles and motorists, who were stopping on the two-lane highway to avoid hitting them. The Minnesota DNR says helping turtles, particularly females with eggs, safely cross roads is vital to the preservation of Minnesota’s turtle populations. The tunnel is already a success. The Minnesota DNR Nongame Wildlife Program has been posting photos on their Facebook page from a motion camera installed in the tunnels. Turtles, frogs, skinks, woodchucks, ermine, and many other creatures have been using the tunnel to safely cross under the road! How can YOU help a turtle cross the road? Don’t endanger yourself or others. When and where possible, pull off the road. Turn on hazard lights to alert other drivers to slow down. Be aware of your surroundings and traffic. Allow turtle to cross on its own. If there is no oncoming traffic, allow turtle to cross unassisted. Snapping turtles should NEVER be picked up by the tail. This can damage the snapping turtle’s spinal cord. Use a branch, broomstick, or snow shovel to prod the animal along from behind. If the turtle bites the object, use it to drag the turtle to roadway edge. Maintain direction of travel. Move turtle low to the ground, in a direct line, and in the same direction it was traveling. Do NOT remove it from its area of habitat.